When many people picture a divorce, they think of years of unhappiness, frequent fights, and an overall feeling of animosity between both partners in a marriage. But many divorces begin with one spouse caught completely off guard by the news that the other wants to end the marriage. If you’re on the receiving end of that news, it can be difficult to process. One minute your life was moving ahead on a normal, familiar, and comfortable path, and the next minute it’s careening wildly off track. The person you loved and trusted the most now wants to end the relationship, and you may be left wondering what went wrong and what you should do next. At the Law Office of André J. Ausseresses, our Irvine family law attorneys know what you’re going through. A divorce is one of the most stressful things anyone can experience. In fact, some studies show that it’s the second most stressful life event just after the death of a spouse or child. You may not be able to think clearly during such an emotional time, but it’s vital that you take the right steps to protect yourself and your rights. Get a legal team on your side that knows divorce and family law today. Call our office at (949) 244-8871 or complete our online contact form to get in touch with our attorneys—we’re here to help. 1. Stay calm—This is easier said than done, but remaining calm during the minutes, hours, and days after being notified that divorce is imminent will pay off big time down the road. Saying or doing something you might regret can cause serious and irreparable harm to your chances of securing and maintaining the things that will matter most in the years to come, including custody, visitation rights, and access to the financial security you worked hard to build. It’s important to remember that while the news may be shocking to you, your spouse has been thinking about it for a long time, and that means she has the upper hand. Staying calm allows you the opportunity to begin the divorce process on as even ground as possible. 2. Stay as close as you can with your children until the divorce is finalized—It can be tempting to get as far away from your spouse as possible when she says she wants a divorce. But doing so may have a negative impact in the eyes of a family law judge when it comes to child custody, which in turn may have an effect on what is in your children’s best interests. Continuing to live with or near your spouse during the early and latter stages of divorce proceedings can be awkward, uncomfortable, and even downright miserable, but it’s essential for allowing frequent and continuous contact between your children and yourself. 3. Surround yourself with caring family members and friends—The emotional toll of divorce can’t be overstated. Your spouse has already mentally and emotionally grieved the loss of the marriage and relationship, but you’re still in the beginning stages of processing what’s happening. Dealing with your feelings alone can be difficult, but having close family members and friends around can make it easier to handle what may be a lonely time for you. Don’t be afraid or hesitant to seek out professional help if you need it. Qualified therapists can help you make positive changes in your life and in your thought patterns—both of which will pay off in the days, weeks, and months to come. 4. 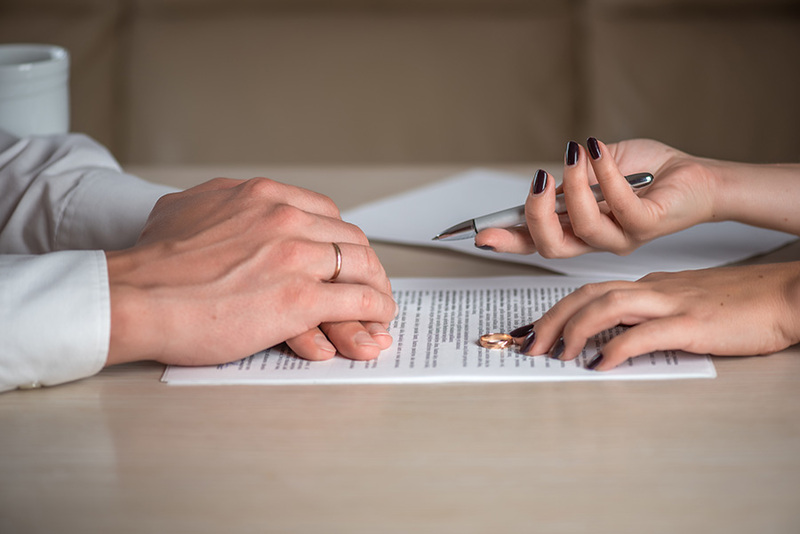 Manage your finances and gather important documents—Divorces are rarely clean, amicable splits where both parties wish each other well and immediately begin living separate lives. They frequently involve messy battles over finances, debts, and assets. The more information you have concerning those parts of your life and your marriage, the better. Separating your finances by opening your own bank accounts and credit cards can help you protect your assets, and making copies of documents such as marriage certificates, property papers, vehicle titles, stock portfolios, and tax records can help you and your lawyer have a better idea of who owns what when divorce negotiations begin. 5. Start thinking about the future—Dwelling on the past is never a good strategy for anything in life—especially a divorce. If you’ve made an attempt to save your marriage by suggesting counseling and your spouse isn’t receptive, there’s little you can do to change her mind. Instead of focusing on what just happened, it’s important to look towards your new life. If you have children, start thinking of their needs during what may be an upsetting time for them. Even if you aren’t on good terms with your spouse, it’s important to come together to find a way to tell your children about the divorce in a calm and supportive way. Finally, focusing on your own needs, including your health, career, and hobbies, can also give you something productive to focus on. Divorces are never easy, and it’s common for men to feel overwhelmed—especially when they’re caught off guard. Losing a relationship can be devastating at any age and at any point in life, but when the loss of that relationship can cost you so much more than just companionship and romance, it’s essential that you have someone looking out for your best interests and your rights. Don’t go it alone during this difficult time. Call divorce attorney André Ausseresses and set up an appointment to meet in Irvine. We have years of experiencing fighting for the rights of men like you, and we know what it takes to help you maximize your chances of getting a positive outcome when your divorce is finalized. Trust our experience and our dedication to our clients. Call our office at (949) 244-8871 or complete our online contact form today!